Hi and welcome to my blog. I would like to start this blog by sharing some good news with you. 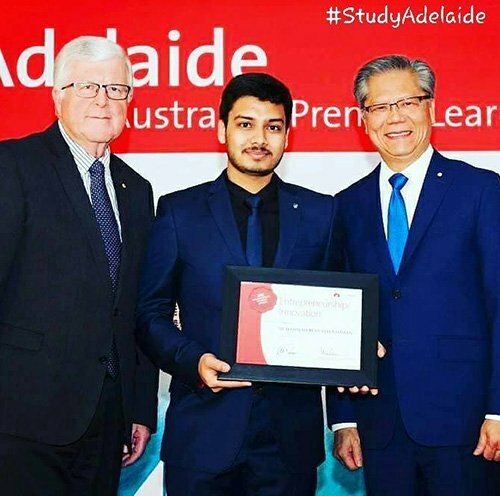 I am delighted and pleased to announce that I, Muhammad Reefath Rahman, am the winner of the “Study Adelaide Entrepreneurship & Innovation Award” (International Student Awards 2016). You might be asking how I came to win this award. Let me tell you a bit about myself and my journey as an international student at the University of South Australia and living in Adelaide. Event Assistant, Student Event Manager at the University of South Australia. As you can see, life is busy. Study Adelaide is a government organisation that helps students make the most of their study experience in Adelaide, and this includes celebrating their achievements. 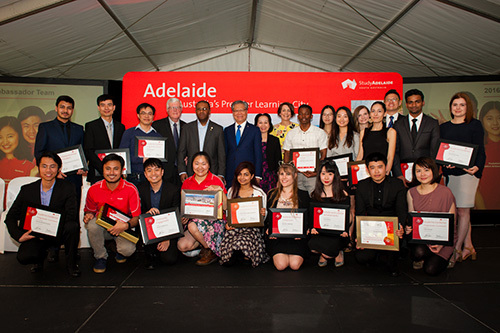 Study Adelaide recently held the sixth annual International Student Awards with the Governor of South Australia presenting the awards. The event consisted of the Governor’s farewell to all international students who have completed their studies and the announcement of the 2016 International Student Awards. Around 3:30 pm I arrived at the Adelaide Government House Gate along with all the invited international students. As we walked in, I had a chat with some of them and shared the excitement to be part of this amazing event. The award ceremony took place in the gardens of the Adelaide Government House inside a large air-conditioned marquee. Luckily the weather perfect for an outdoor event. Later around 5:00 pm the Governor delivered an inspirational speech and congratulated all the international students studying in Adelaide. Then the announcements started one by one: each category consisted of two awards– one to the category winner and one to the runner-up. There was also an award to the International Student of the Year chosen from across all category winners. Later there was a group photo of all the award winners with the Governor of South Australia. Afterwards, the party started! Everyone took photos of their friends and family and met with the other winners. 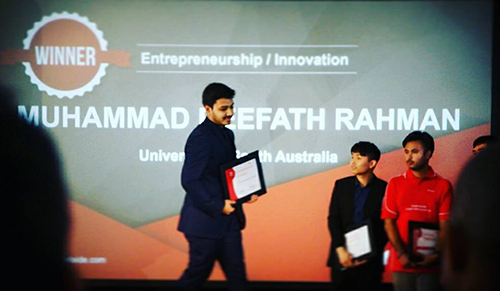 When the MC announced my name “Muhammad Reefath Rahman, from Bangladesh, studying at the University of South Australia is the winner of the Entrepreneurship & Innovation Award,” I felt like I was in heaven. It was the moment I was waiting for all year. I have won many awards, but this was special. Very very special! It was one of the proudest moment of my life. I felt grateful because I won the award as both a student and staff member of UniSA after competing with Adelaide University and Flinders University. And I was happy because I could bring this award to the University of South Australia and represent my university in the state competition. A big thank you, to you and all the tutors and staffs, who have provided me with guidance and support in various university projects. I am thankful and appreciate the motivations and guidance all the way. And special thanks to the Global Digital Recruitment Team (GDR) of UniSA International of the University of South Australia for giving me an opportunity to be a part-time staff as an International Project Assistant.